The morning is always busy. With kids, work and school it’s hard to find even a moment to consider putting together a healthy breakfast. You’re lucky if you grab a donut from the break room before settling in to work with your coffee. But a healthy breakfast doesn’t mean tons of time spent making it. 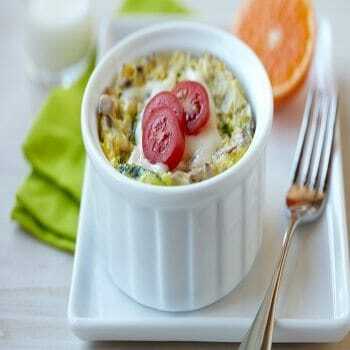 We’ve gathered 5 healthy breakfast recipes that are fast, delicious and nutritious. This recipe is a favorite go to. Requiring only two pieces of whole grain bread, a ripe avocado and an egg. 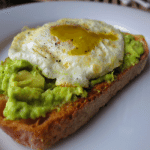 Lightly toast the bread and fry the egg sunny side up while scooping out the ripe avocado flesh. Quick tip, you can remove the seed of the avocado by sticking a knife in it and twisting. Slice the avocado lengthwise, season with salt and pepper and drop the egg on top for a healthy dose of protein. If you want to take it on the move, you can hard boil and slice the egg and make a simple sandwich. Smoothies are a great on the go snack and work great a healthy breakfast that can be whipped up quick. 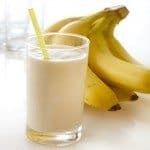 Blend 1 frozen banana, 2 heaping tablespoons of peanut butter, 1 cup of almond milk and a few ice cubes. Blend together until smooth and store in a tightly sealed travel mug to sip on the way to work. A tried and true classic and one of the easiest and healthiest breakfasts you can put together in no time. If you’re looking to cut sugar, use plain yogurt drizzled with honey and then top with whatever fruits and toppings you prefer. In season strawberries or nuts, apples or bananas all make healthy options for this flavorful breakfast. Store it in a Tupperware container and snack on it when you get into the office. Don’t be put off by the idea of using a microwave to make scrambled eggs; zapping your eggs can make for very tasty scrambled eggs. All you have to do is beat two eggs in a microwave safe dish and add some veggies (spinach and sliced cherry tomatoes work well) and a bit of cheese. Microwave on high for 30 seconds, stir and then cook for another 30 seconds or until eggs are firm. Throw a top on the container and you’re good to go. 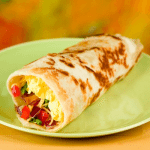 These work best as a breakfast item prepared ahead of time. 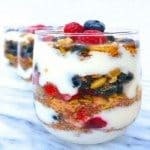 If you find that you often skip breakfast because you run out of time to prepare something or can’t be bothered, this make ahead option can work well for you. Scramble 2 egg whites, 1/4 cup black beans, 2 tablespoons salsa, and 2 tablespoons shredded cheese, and wrap in 1 small whole-wheat tortilla. Make several in one go, wrap in foil, and freeze them for easy grab and go. The protein in the beans and the eggs will keep you feeling fuller longer!